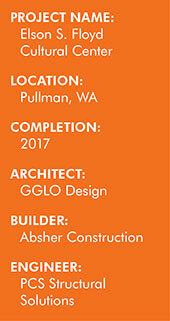 When architects at GGLO Design set out to design the new Elson S. Floyd Cultural Center at Washington State University, they had a number of goals: bring the university’s diverse cultural organizations together under one roof, incorporate natural building materials native to the area into the structure, and build something that would pay special tribute to a revered university president who died too soon. The resulting 16,000-square-foot center, a design-build collaboration with Absher Construction, is set off by an undulating wood roof structure, intended to emulate the rolling prairies of the Palouse, native to the Nez Perce Indians. There are just a handful of right angles to be found in this unique building, and not a single connection in the roof structure is repeated. In other words, it was a structural engineer’s dream challenge. How do you create simplicity out of complexity when everything is unique? Engineers at PCS Structural Solutions designed the connection details for this complicated project using some unique circular base plate designs that had to be paired with rectangular columns and shaped to meet high wind and snow loads. Care was taken to protect the exposed Port Orford Cedar glulam beam tails from weather and moisture as they arch beyond the structure. A total of 62 curved glulam beams went into in the Floyd Center, including curved roof beams, side-curved fascia beams, and double-tapered laminated curved round glulam columns. The maximum length of the beams was approximately 81 feet, with radii ranging from 20 feet to 83 feet, 9 inches. Beam widths range from 3 inches to 8-3/4 inches. Beam depths range from 18 to 36 inches. The main roof curved beams were mostly 8-3/4 inches in width, with some 6-3/4 inches in width. The fascia beams were 3- x 18-inch side curves with a multi-width layup. 125,000 board feet of Port Orford Cedar was used in the manufacture of the beams.